A blockchain White Paper is the cornerstone to researching the business plan and objectives of the entire project which can include an ICO (Initial Coin Offering). It is an authoritative and informational document highlighting a specific topic, that presents a problem and then moves on to provide a solution. It should be the primary tool for anyone deciding whether to participate in an ICO or not, and one of the best ways to understand the entire scope of a project. A White Paper should be clear and concise and provide, all the information needed to make a decision. White papers are advanced problem-solving guides designed to educate their audience about a particular issue, or explain and promote a particular methodology. Generally, there are no formatted standards when discussing token issuance and ICO’s but, the one thing they all have is a White Paper. The challenge with White Papers is that, there is no standard universal structure or best practice when preparing or examining these documents. They should at minimum, address the problem that the ICO and blockchain intends to solve. If the project includes the implementation of a crypto currency, the White Paper should detail the utility token deployment and plan. How it will be implemented, specifically, how the token works with the product to give the reader a better understanding of the token distribution and what the buyer will receive in exchange for purchasing the token. To appreciate its value, a crypto currency will need wide acceptance and usage. Finally, the white paper should give the reader a better understanding of the management team that is bringing the project to market. Here it is important to determine if the team has significant blockchain experience with a deep functioning blockchain engineer. The team is crucial and should never be overlooked. Talking about the project team, there is a mature attitude taking shape. Projects are moving away from pure crypto ventures towards, concepts that are more industry oriented. In this scenario, the team needs to focus on talent that has an in depth knowledge of the specific industry. While this does not mean that technical experts are redundant, it surely means that a more balanced team should be configured. The White Paper should provide the reader with deeper insight to whether there is an existing ecosystem for the product being considered which will give the token a higher probability of being useful in the marketplace. Before buying any ICO make sure that, you read the White Paper first and understand the direction of the project. The GLITZKOIN White Paper is an example of a reasonably priced ICO. The project includes a strong plan to construct a state of the art diamond trade platform using the Stellar based blockchain. GLITZKOIN has assembled a strong team of technical experts combined with, tenured management professionals with decades of experience in the diamond industry. A blockchain White Paper is the cornerstone to researching the business plan and objectives of the entire project which can include an ICO (Initial Coin Offering). It is an authoritative and informational document highlighting a specific topic, that presents a problem and then moves on to provide a solution. It should be the primary tool for anyone deciding whether to participate in an ICO or not, and one of the best ways to understand the entire scope of a project. A White Paper should be clear and concise and provide, all the information needed to make a decision. White papers are advanced problem-solving guides designed to educate their audience about a particular issue, or explain and promote a particular methodology. Generally, there are no formatted standards when discussing token issuance and ICO’s but, the one thing they all have is a White Paper. The challenge with White Papers is that, there is no standard universal structure or best practice when preparing or examining these documents. They should at minimum, address the problem that the ICO and blockchain intends to solve. If the project includes the implementation of a crypto currency, the White Paper should detail the utility token deployment and plan. How it will be implemented, specifically, how the token works with the product to give the reader a better understanding of the token distribution and what the buyer will receive in exchange for purchasing the token. To appreciate its value, a crypto currency will need wide acceptance and usage. Finally, the white paper should give the reader a better understanding of the management team that is bringing the project to market. Here it is important to determine if the team has significant blockchain experience with a deep functioning blockchain engineer. The team is crucial and should never be overlooked. Talking about the project team, there is a mature attitude taking shape. Projects are moving away from pure crypto ventures towards, concepts that are more industry oriented. In this scenario, the team needs to focus on talent that has an in depth knowledge of the specific industry. While this does not mean that technical experts are redundant, it surely means that a more balanced team should be configured. The White Paper should provide the reader with deeper insight to whether there is an existing ecosystem for the product being considered which will give the token a higher probability of being useful in the marketplace. Before buying any ICO make sure that, you read the White Paper first and understand the direction of the project. The GLITZKOIN White Paper is an example of a reasonably priced ICO. The project includes a strong plan to construct a state of the art diamond trade platform using the Stellar based blockchain. 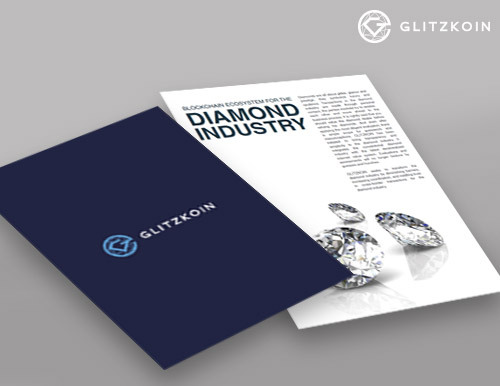 GLITZKOIN has assembled a strong team of technical experts combined with, tenured management professionals with decades of experience in the diamond industry.